If you have birds, you are likely to be well clued-up on feather plucking – an obsessive and hugely destructive pattern of behaviour that largely affects caged birds. Not only is feather plucking detrimental to the physical appearance and health of your bird, it is hugely disconcerting for you, the owner, and especially challenging to treat. 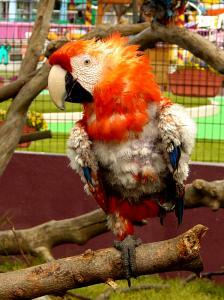 Birds most likely to be affected by feather plucking include African Greys and Timneh parrots, although all captive birds are susceptible to it. Besides other things, the striking colours and attractive physical traits of birds like parrots, budgies and cockatiels are one of the many reasons people keep birds in the first place. When they start pulling their feathers out, appearance declines and birds start looking unhealthy. But at least this means the problem is easily detected and you can start finding a solution for it. But why do birds pull their feathers out? There are several reasons why caged birds pick their feathers, ranging from medical causes to social and environmental factors. Most people tend to think of feather plucking as a behaviour relating to stress, although it can also be due to habit, genetics and various physical factors. When we think about medical causes for this maladaptive behaviour, we tend to think of parasite problems and allergies, hormone changes, systemic illness, nutritional deficiencies and fungal infections, although there is debate about whether these conditions definitively cause feather plucking or are just coincidental. It certainly makes sense that a bird with parasites should pick out its feathers through frustration or scratch already irritated skin. But this behaviour is self-perpetuating, with inflammatory skin disease leading to over-grooming and eventually feather plucking, and over-grooming and feather plucking leading to sore, inflamed skin. If you are going to be successful in preventing feather plucking, you need to find a way of breaking the cycle. But medical conditions aside, many perfectly healthy birds obsessively pick out their feathers, leading to bald patches and injuries. While there are other causes - as already discussed - the majority of cases are the result of chronic stress. Early experiences including being separated from their mothers too early, poor socialisation and failing to learn appropriate preening behaviours can all contribute to a feather problem further down the line. Likewise, isolation can cause considerable frustration and stress, leading to maladaptive behaviour patterns. In the wild, birds would have the freedom and opportunity to form stable relationships with others – something which is generally denied to birds in a captive environment. The umbrella term ‘isolation’ includes the deprivation of social and sexual relationships, which can often lead to loneliness and separation anxiety, as well as bored and attention-seeking behaviours. Although there is no definitive evidence to support a correlation between feather plucking and stress, many studies have examined stressors (including isolation, deprivation and poor enrichment) as a causal factor for the behaviour and many have supported a link. It was found that birds with stimulating habitats that had to forage for their food, as they would in the wild, were far less likely to feather pluck. When African Greys were provided with pipe feeders rather than bowls, their feeding time increased significantly along with their feather plumage. How do I prevent my bird feather plucking? Breaking the habit can be challenging and unfortunately there is no quick-fix solution. After visiting an avian vet to rule out medical conditions, think about adapting your bird’s environment to remove stressors and provide greater enrichment. There are many things you can try, and many products on the market for enhancing environment and helping alleviate boredom. Some birds will respond positively to change, while others will continue down the route of feather plucking. Get a bigger cage, change its location, add a perch, provide a variety of foods – anything you can think of that’s new, exciting and likely to be beneficial to your bird’s mental state. Concentrate on foods that represent a variety of colours, textures and tastes and that also require time to eat. A range of toys should be available to your bird at all times, including bells, mirrors and natural hardwood pieces. The more you divert your bird’s attention, the less likely it is to pursue its vice. I have a very happy African grey 4yrs old.he is very chatty and sociable.he is out of his cage often and up till a month ago would fly around the house.he then chewed his flight feathers off on one side only.he cant fly now .any one have any solutions as to why he has done this. I have an African grey who is 4 in December he has started to pluck the White dowl feathers under his wings doesn't pluck the big feathers just the small ones. Very odd. Vet said he was over weight been trying to cut his food down, also been taking him in the shower with me at a bit of a loss. Feel awful everytime he does it. When I adopted my galah cockatoo she didn't have any feathers on her back. After 6yrs she has been plucking her chest feathers whether she in her cage on sitting on my shoulder I know she preens but then she will suddenly yank at one of her quills and out it comes. please help, if you have any ideas, she eats all greens, plus nuts; seeds etc and a small amount of chicken.